Walking on water isn't just for religious deities anymore. Anyone who can make it to Lake Iseo in northern Italy in the next three weeks can now experience the feeling thanks to a spectacular art installation called "The Floating Piers." 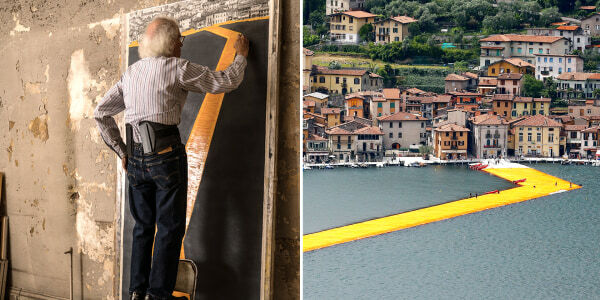 The nearly 2-mile walkway across the lake from the mainland town of Sulzano to the islands of Monte Isola and San Paolo was originally conceived in 1970 by the Bulgarian-born artist Christo Vladimirov Yavachev, 81, and his late wife Jeanne-Claude, according to the project's website. Funded through the sale of Christo's artworks, "The Floating Piers" was unveiled Thursday at Lake Iseo, which is 62 miles north of Milan. It will be open to the public through July 3, weather permitting. It took divers anchoring together 220,000 high-density polyethylene cubes covered by 1,076,391 square feet of yellow fabric to create the "piers," which are 52 feet wide and 14 inches high. The walkways undulate to the movement of the water as people move across them, and volunteers are present for safety reasons in case anyone falls in the water. The walkways are accessible 24 hours a day to the public and there is no charge, and tickets or reservations aren't required. "The Floating Piers" came together in just under two years, compared to Christo's 2005 project known as "The Gates," an installation in New York City's Central Park that took 26 years to create. See photos of the conception and completion of "The Floating Piers" by artist Christo on Lake Iseo in northern Italy.